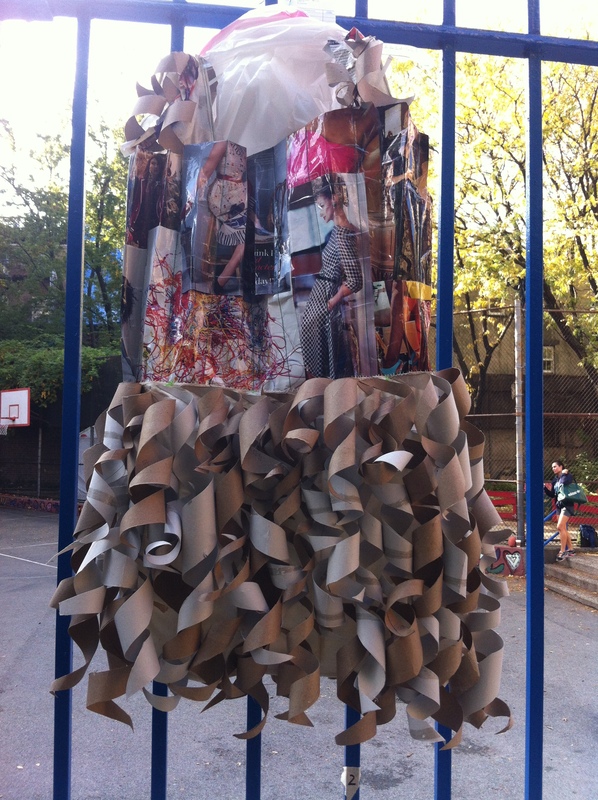 On that beautiful Saturday morning, EIGHT amazing creative Designs were hung to the gate of PS 11 in Chelsea. Passerbys came and went and gazed at the sartorial creations that flapped in the wind. They were all made from everyday materials such as plastic bags, plastic streamers, paper toilet rolls, magazines, newspaper, cardboard and even old CDs and buttons. ‘Vote for your favorite one! 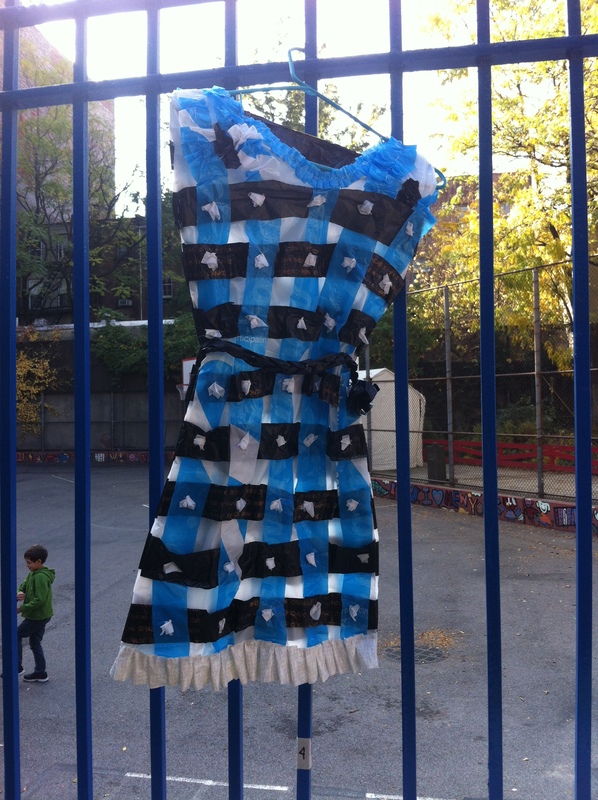 Say Yes to the Dress!’ cried Ms. Dahill, our librarian, to the Chelsea residents that slowed down. She convinced many to vote and after 300 votes, this was the tally..
1st PLACE – DEANNELYS CORCINO CRUZ – FRESHMEN : The design is one I am proud to add, I assisted in executing. Deannelys came to my classroom for assistance on how to make a garment made completely out of cardboard. With little guidance, she went on to create an awesome fit and flared cage, made of cardboard and tape, then covered in newspaper and magazine. 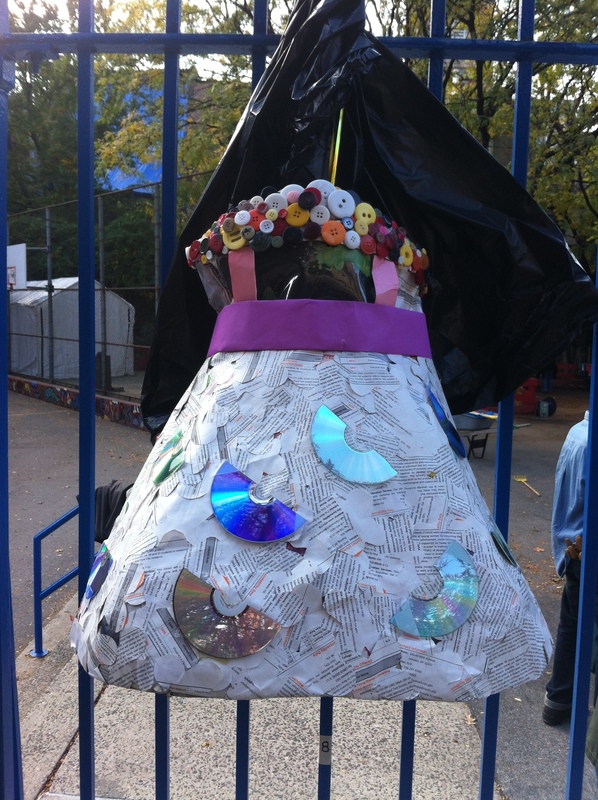 She then decorated it with old CD’s and buttons! Genius! 2nd PLACE – MILANDY MOSQUERA – FRESHMEN : This perfect little sheath made of plastic was decorated using woven streamers. Blue, black and white were the perfect trio to represent this woven delight. 3rd PLACE – NYESHA LEE BARROW – SOPHOMORE : Coming in Last but not Least was this dual material artistic creation. Magazine and Toilet Rolls were used to bring this one to life. The colored pages accentuate the bodice whilst the curled out toilet rolls add volume to the skirt. It brings me joy to know that our FRESHMEN are becoming a vital part of our school community. Their creativity is beginning to shine through and they are beginning to make a name for themselves. Next – They will be walking down the runway at our Variety Show!! Go strong, future class of 2017!!!! This entry was tagged https://www.facebook.com/belinda.david.14?fref=ts, https://www.facebook.com/judith.dahill?fref=ts. Bookmark the permalink.